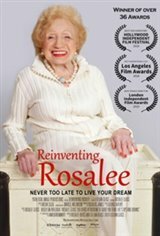 Rosalee Glass is a 101-year-old Holocaust survivor, taken the prisoner to a Russian gulag in Siberia during WW2. After then being taken to Kazakhstan and later to a Displaced Persons Camp in Germany, she made her way to America. She shares her story of survival and transforms her destiny by living her life to the fullest after a life-changing tragedy during her senior years, where she lost her will to live after the tragic loss of her beloved son in a medical malpractice situation. But miraculously, she found the strength that would transform her life and enable her to live her dreams. In her late 80's, she started an acting career. At 94 won 'Miss Congeniality' in a Senior beauty pageant. She was seen by millions in a Super Bowl commercial at 97 and wrote a book sharing her secrets to a long life at 99. And at age 100 she dares to ride with Alaskan Sled Dogs.